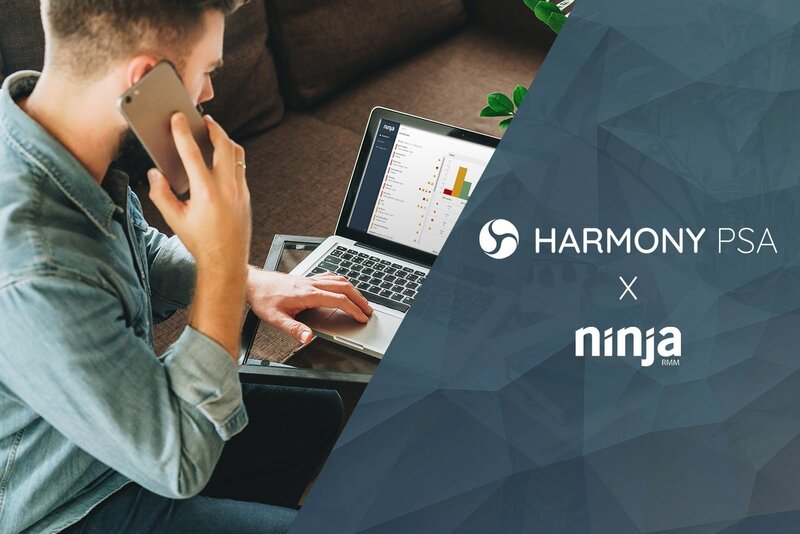 LONDON— February 20, 2018—HarmonyPSA, the industry’s most comprehensive cloud PSA software, today announced its integration with NinjaRMM, a market-leading RMM solution.This latest advancement takes Harmony another step closer to offering the most robust and automated MSP solution in the market, and provides customers a simple means of monitoring and managing hardware and software issues within HarmonyPSA. This new integration allows MSPs to spend less time diagnosing problems, and more time focusing on their customers’ needs. The Ninja integration—the latest in a series of integrations Harmony has planned for 2018—allows MSPs to include all NinjaRMM notifications in Harmony’s Tickets view, allowing customers to be immediately notified about issues in their hardware or software.The integration covers client account mapping, automatic asset discovery (into a staging list in Harmony to provide control over asset acceptance under contract) and automatic ticket open/close based on Ninja alert messages. Available now, through a seamless and quick connection from Ninja to HarmonyPSA, customers can get notifications about monitoring system events, disk space and health, software updates, and other important information from their clients. In addition, the integration allows current Ninja customers to purchase HarmonyPSA and connect their RMM with their PSA tool. Ninja has amassed a large MSP client base, and is designed to work with companies ranging from single-person operations to large enterprise service companies providing full SLA service offerings. The Ninja platform offers an easy and simple-to-use web interface that includes zero training time, one-click drill down with integrated search as well as one-click remediation. With 360 degree monitoring, Ninja gives MSPs a measurable way to provision, monitor and manage their infrastructure. Harmony Business Systems Ltd (HBS) is the company behind HarmonyPSA, the most complete cloud PSA software on the market. Developed with functionality to cater for even the most complex needs of MSPs, VARs, ISVs and Professional Services organisations, HarmonyPSA truly is the next generation of PSA systems. HBS is an independent company based in the UK. For the latest updates and news, follow HBS on twitter @ #HarmonyPSA.